Is It Better To Invest In The US or Australia? Is It Better To Invest In The US or Australia? Is it better to invest in property in the US or in Australia? With so many people making money in the US what are the pros and cons of each investment strategy? 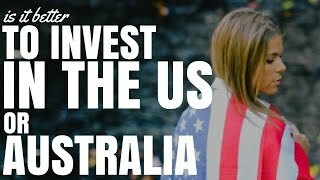 Is it better to invest in the US or in Australia? Both can be profitable. So what is best for me? Hey, I’m Ryan from onproperty.com.au, your daily dose of property education and inspiration. And today I want to talk about investing in property in the US versus investing in property in Australia. I want to talk about some of the pros and some of the cons so that you can make an educated decision for yourself as to what is best for you or at least what is the best option for you to look into right now. Now, I just want to start by saying both can actually be very profitable. I’ve heard of people making a lot of money by investing in Australia – that’s what we talk about here on On Property, I’ve interviewed a lot of people who made a lot of money in property in Australia. But there are also a lot of Australians making money in the US and I have interviewed a guy called Ben in episode 103 so go to onproperty.com.au/103 and he’s making his money investing in the US. Steve McKnight, who is the famous author of 0 to 130 Properties in 3.5 Years, awesome book if you haven’t read it by the way, onproperty.com.au/130 to go to Fishpond and you can buy that book, amazing book. But he shifted strategies away from Australia and started investing in the US and has been having a lot of success over there and has actually been hoping his students invest in the US. So both can be extremely profitable. There’s people making money in Australia and there’s people making money in the US. So let’s look at some of the pros and the cons of each of them. One of the major draw cards for the USA that I keep hearing about is that rental yields are extremely high so cash flow can be absolutely awesome. If you are measuring your return of investment in terms of cash-on-cash return – so how much cash you get each year based on the amount of cash you put into a property then the cash-on-cash return of these properties in the US can be extremely high especially if you’re borrowing money by accessing equity in Australian property to invest in property in the US, which is what we talked about in the last episode, episode 273 at onproperty.com.au/273. So cash-on-cash return can be great, rental yields can be extremely high. You know the highest rental yield that I think I’ve listed in On Property Plus was something around 14% rental yield for a property that was a combination of commercial and residential property. But that’s the highest I’ve ever seen. You know, high rental yield properties in Australia is basically anything over 7% and if you’re getting over 10% then that’s extremely high rental yields in Australia. However in the US, you can get rental yields that are significantly higher. I think Ben was getting 14% rental yield net, which we’re talking over 10% gross rental yield in Australia is really high, so he’s getting 14% net which means he’s getting 17%, 18%, 19%, 20% gross rental yields over there. So rental yields are a massive draw card for the US. And if your strategy is positive cash flow and financial freedom through cash flow then it might be something that you would want to explore. Alright, with the US – and this is no different with the Australian market, you still need to buy in the right area and you need to do your research into the area. But something that you need to think about in the US is that you actually need to find the right rental agent. The market in Australia – and you can be forgiven for thinking that the US is just the same, in Australia, real estate agents sell property and they manage the rental property as well. Almost all areas have real estate agents that sell property and do rental property as well. So before you go ahead and invest and before you put money down on a property, make sure that you can get a rental manager to help you out. Otherwise you’re going to have to do it yourself and that’s going to be a lot of expensive flights over to the United States in order to do that. Another thing that you need to consider if you’re going to invest in the US – and we talked about it in the last episode, episode 273, is that it’s very hard to get financing for investing in property in the US. US banks generally won’t lend Australian private individuals money. Australian banks won’t use the property that you’re investing in in the US as security on a loan here in Australia. So what most investors are doing is actually drawing money from their existing Australian properties – so getting an equity loan and then taking that cash and using that to invest in property in the States. Or there are some people that have enough money to go over and just pay cash for these properties and they’re getting the returns that they want. As I said, solid research is still needed. We hear a lot about investment hotspots, investing in America, you’re making all these money, it’s a golden area for investing. But the fact of the matter is you still need to do your research because there are good properties and there are bad properties. There are good areas and there are bad areas. So you need to know what the good areas are and that is going to take some research and likely you’re going to need to team up with someone in the US or team up with someone like Steve McKnight who has a team in the US that can help you out. So definitely, solid research is a must if you’re going to invest in the US. It’s not just something that I would be willing to put my money into and simply hope for the best. I’d be wanting to do a lot of research if I was going to go and do that. I want to let you know when you’re considering US versus Australia, most of you who are considering US will be thinking cash flow, you won’t be thinking capital growth because we know we can get capital growth in Australia if you choose the right areas, so why not just do that. Generally if you are going after the US you are going after the cash flow. So I do want to let you know that it is possible to generate positive cash flow here in Australia. It’s harder than maybe in the US. It’s harder than finding negatively geared properties in Australia but it is possible. Look, I know because that’s what I do. I help people find positive cash flow properties. I teach people how to find them. I go out and find them myself and list them for my members to see and so positive cash flow properties do exist. You want to invest in positive cash flow properties in capital cities, it is still possible. Look for a property that has a granny flat on it. Look for opportunities to create a higher rental yield than expected either through granny flat or through renovation or dual occupancy or something creative like that. So just know that if you are going after cash flow, it is still possible in Australia. It’s harder and it’s probably going to be less rental yield and less cash-on-cash return than what you’re getting in the US however you have the benefit of it’s easier for an Australian to understand and invest in the Australian market than it is to understand a completely different market. Well, at least in my mind it is hard enough for me to get my head around the Australian market and I’m in property every single day to think about getting my head around the US market is a big endeavor and I know it’ll be a big endeavor for a lot of people. So that’s something that Australia has a massive plus on. Because if you’re an Australian living in Australia, you naturally understand the market because you live in it. You live in a property, you either rent a property or you own a property, you know how it works. You know how it goes down and you can find advice. You can call up a conveyancer here. You can call up a solicitor. You can call up a mortgage broker. You can go and have coffee. You can go pick people’s brains and then know the market and know it really well. When you’re going to the US, that’s a lot harder to manage, it’s a lot harder to get that advice and to understand a completely different market. You need to know your goals. So this is what I’m going to finish with is that your goals are the most important thing that you need to understand. I recently did an interview with Ben Everingham from Pumped On Property who’s a buyer’s agent. And me and him have had a good relationship over the last year or so. We are massive on income replacement as a goal. And looking at what income are you generating now and let’s look at how you can generate a passive income through property that matches your income now so that you have the flexibility to leave your employment if you want, start a business, do whatever it is that you want to do. But your goals might be different. It might be income replacement. It might be something completely different. But depending on what your goal is, that is going to change what strategy you go after and what strategy you use completely because there’s not one perfect investment property either in the United States or in Australia. Depending on your strategy, depending on how you want to invest and what you want to achieve, that’s going to change the types of property you invest in as well as the country you’re going to invest in. So get really specific on your goals. Really understand what is it you want to achieve and just get down to what is it that you really want to achieve through this. I recently wrote a post about 6 months ago, which was an update over 5 years ago so about 5.5 years ago now. I wrote this article on my postal blog. I wrote ryanmclean.net and I said why am I going to be financially free in the next 5 years. And I gave all these reasons – it was a very cocky article. I gave all these reasons why I’m going to be financially free in the next 5 years. And I wrote an update because I’m not financially free at the moment and I said well, here’s an update of my situation. And something that was really interesting to me was in that article I wrote 5.5 years ago, I said as point no. 7 – yeah I had 7 points as to why I was going to be financially free. In point no. 7 I said I’m going to be financially free because I know my why. I have a strong reason why I want to achieve financial freedom. And my strong reason was that I want to be able to have the flexibility to spend as much time with my family as I wanted. I didn’t want to quit my job. I didn’t want to not work. I wanted to work but I wanted the flexibility to spend as much time with my family as possible. And the second thing was I wanted to have a platform to help make a positive impact in people’s lives. Back then I was probably thinking something around Christianity and church, and having that sort of platform around there. Or something like what I’m doing now in terms of education. And I looked at my life 6 months ago when I reviewed this 5-year goal that I had that I didn’t hit. And I said, “Well, I’m working for myself now and I have the flexibility to spend as much time with my family as I want.” You know this morning I started work at 11am and I’m going to work late, about 8pm tonight. But I started work late because has swimming in the mornings so I went and watch him do swimming and play with him in the pool. I had that flexibility in the morning to start late and work a bit later in the night. Tomorrow, my daughter’s got an Easter parade and I’ve got some parent teaching interviews and I’m going to dancing recital, I think next week. And look, I have the flexibility that I want to spend time with my family when I want to and I’m also having that impact in people’s lives, appositive impact in people’s lives. So I give this story and there is a reason why I gave this story. And that is sometimes we seek financial freedom for reasons other than financial freedom. I was saying I want to be financially free so I can achieve these two things. Well, 5 years later I’m not financially free but I’ve achieved the 2 things that I wanted to achieve. So really sit down and really understand what income goals do you have, what is it that you really want to achieve. And for me was that flexibility of time and having that positive impact in people’s lives and that was something I was able to achieve running my own business. Man I wish 5 years ago that I knew that there are actually multiple paths to achieve what I had really wanted and actually sort out if is property the best way through this, or is it business or is it something else. So really get to know your goals so you can choose between Australian property or US property or maybe something else altogether. Alright. That’s it for me. I’m Ryan from onproperty.com.au. If you are interested in high rental yield properties, then I do have a list of 10 positive cash flow properties here in Australia that I’m willing to share with you. Go on to onproperty.com.au/free to get access to that and to check out those properties there. You can see the areas that those properties are in. You can see the types of properties that they are and that could help you in your search, moving forward, looking for positive cash flow properties in Australia. So that’s it, go to onproperty.com.au/free. Otherwise, until next time. Stay positive.